This is a recipe for a “sweet basil pesto tapenade,” but I use it as a normal pesto paired with whole-wheat pasta (the fresh kind, if you can find it). The flavor is FANTASTIC, one notch above everyday normal pesto, but like normal pesto it’s absurdly easy (and, if you’ve got sweet Italian basil growing in your garden, pretty darned cheap). The maple syrup gives it some nice mellow notes, but the flavor’s also bold enough that, paired with good pasta and a little Parmesan cheese (ok, maybe a simple salad on the side), this is more than sufficient for a good dinner. Use a little more olive oil and a little less walnut to make it more pasta-pesto; use the given amounts to make it a tapenade for putting on pesto pizza, sandwiches, or those fancy little toasts (whose name escapes me at the moment). I hear it’s also great on roasted squash. I’ve tried this with Thai basil as well instead of the standard Italian sweet kind, and it’s a little less perfect but still pretty tasty. You can toast the walnuts before you mince them for a mellower taste, but I think the bit of tang from fresh walnuts works better with the lemon and the maple. 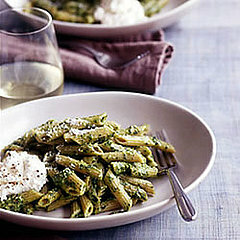 I’ve had a nice dinner with this and artichokes roasted on a barbecue, with salad dressing for dipping the artichokes. Chop the basil, garlic, and most of the walnuts in food processor until chunky, stopping often to scrape the sides. Add oil(s), syrup, and lemon zest or juice. Add Parmesan as you like, and process until thick and creamy, adding more or all of the walnuts to get the texture you want. Season to taste. Can be stored in a glass jar with a thin layer of olive oil on top (to prevent oxygenation) until ready to serve. MUCH BETTER FRESH.